Team GWS this afternoon officially announced the signing of Bayanda Sobetwa (pictured) with the following release. Team GWS has secured its first international player, with South African Bayanda Sobetwa today accepting a scholarship with the new AFL team for Greater Western Sydney. He will fly to Australia this month to begin training and will play with the Team GWS TAC Cup side for the 2010 season. Sobetwa, a 19 year old from Khayelitsha Township - south east of Cape Town, was presented with his scholarship by Justice Linda Dessau and AFL Community Engagement & Talent Coordinator Michael O'Loughlin, during the Flying Boomerangs tour of South Africa. 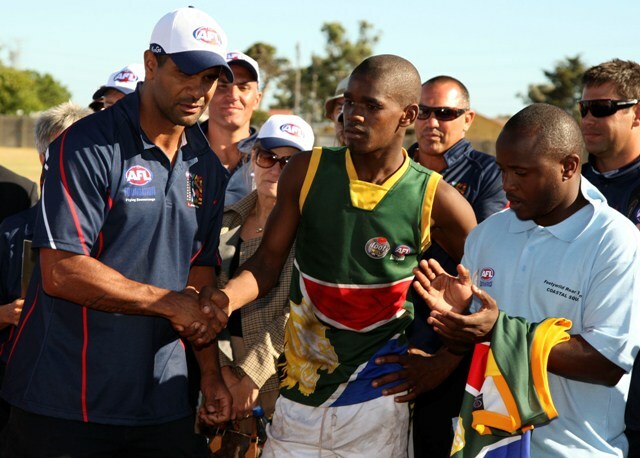 Sobetwa, who started playing AFL in 2007 when footyWILD was introduced in his community, now paves the way for other local talent, as he becomes the first ever player from the South African pathway to be signed to an AFL club. His impressive talent was first recognised in December 2007 when he took part in the Adam Ramanauskas talent camp in Pretoria, where he showed great ability. Since then he has gone on to represent South Africa against the AIS/AFL Academy in 2008/2009 and had fantastic performances at the 2008 International Cup in which South Africa came third out of 16 countries. In December 2009 he trained with North Melbourne Football Club after receiving the Mtutuzeli Hlomela scholarship. As part of his scholarship with Team GWS, Sobetwa will also undertake an AFL SportsReady Traineeship which will combine study and work in multicultural development in Western Sydney. Kevin Sheedy, Team GWS Head Coach and one of the driving forces behind the AFL SportsReady program, said that Sobetwa’s scholarship is a huge achievement following the AFL’s work in South Africa. “It’s great to see that the time we’ve spent in South Africa is starting to bear some real opportunities for these kids that may never have had the chance to play top level sport. “It’s tremendous to have AFL SportsReady support this young man’s future. It’s quite amazing where these types of opportunities can take young people today - over 6,000 young people have found a job through the program. “The essence here is that the game is moving outside of Australia, a lot of hard work has been done by Brian Dixon and the AFL staff in South Africa to create this pathway. It’s clubs like Team GWS who will need to strengthen that pathway for the many international people coming to Australia. AFL SportsReady CEO, Phillip Campbell, said they were extremely proud to offer this opportunity to Sobetwa. “AFL SportsReady is a company committed to providing employment opportunities to a diverse range of people and we congratulate Bayanda on being the first player signed on the AFL's South African pathway. “Through his AFL SportsReady traineeship Bayanda will earn a wage and learn on the job whilst being supported by our mentors and staff who will assist in guiding his career aspirations. Having a 90 percent successful completion rate for our trainees sets Bayanda up for a successful journey. “To be able to support Bayanda in his sporting and employment endeavours is a wonderful opportunity and we are so proud to be associated with such a talented young man who will be a very positive role model.” By successfully completing the 12 month traineeship Sobetwa will obtain a Certificate III in Sport and Recreation. The AFL has identified South Africa as a priority market for the International development of the code. AFL South Africa now has more than 15,000 participants across four Provinces; Gauteng, North West, Kwa Zulu Natal and Western Cape. The Flying Boomerangs, a squad of 25 Indigenous teenagers from through Australia are currently touring South Africa. The squad is coached by recently retired Sydney Swan Michael O’Loughlin. This is the third AFL Indigenous Youth Tour to South Africa. The players’ selection follows their attendance at the Qantas AFL KickStart Camp in Melbourne in August. Sobetwa flanked by Michael O'Loughlin and Mtutu Hlomela. Some Melbourne coverage this afternoon after the official announcement Richo - The Age and the Herald Sun.